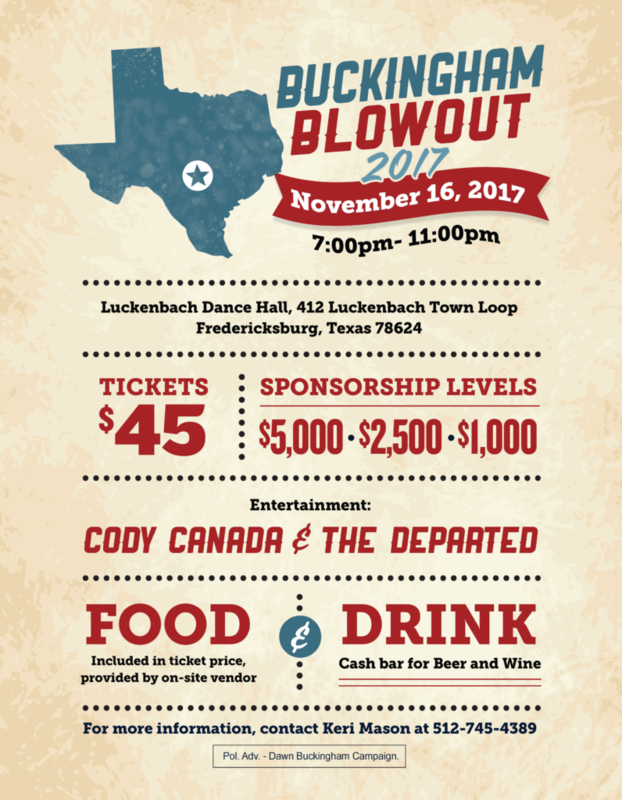 It is not too late to attend Senator Dawn Buckingham’s annual event at historic Luckenbach Dance Hall. This year’s event will feature Cody Canada & The Departed. Individual ticket prices are $45 per person, which includes dinner. A cash bar will be available as well. Tickets can be purchased online or at the door. All festivities will begin at 7:00 PM. If you are joining the event from Austin, a bus will be available to take you to and from the event. The bus will be picking up in and returning to downtown Austin. If you are interested in additional bus information, please contact Keri Mason. For more information or to RSVP, please contact Keri Mason via e-mail, keri@kerimason.com or by calling 512.745.4389.